I have read many articles about the top 10, top 50, and top 100 or most recently, even, top 500 NBA players of all time. I have also heard many people, from sports casters to basketball fans, talk about the greatest players of all time and who is the greatest. My perception is that the whole procedure of ranking players of different historical periods is fundamentally wrong. Furthermore I believe that when somebody uses the word ‘great’ should be able to identify what greatness means and how can someone judge if a player is great or not. The question in both cases is; which are the criteria or greatness? Because if we get to a point where we are able to identify a certain number of criteria that will identify greatness then we might be able, at least hypothetically, to compare players from different generations. Firstly, I will like to explain why the ranking of NBA players of different NBA eras is fundamentally wrong, by using a notion from philosophy and particularly the concept of ‘genealogy’ of Nietchze and Foucault. According to ‘genealogy’ any event should be treated in its own singularity outside of any monotonous finality and even those instances that were absent, must be defined, the moment when they remained unrealized. Another thing that ‘genealogy’ does “is to identify the accidents, the minute deviations-or conversely, the complete reversals-the errors, the false appraisals, and the faulty calculations that gave birth to those things that continue to exist and have value for us; it is to discover that truth…not lie at the root of what we know…but the exteriority of accidents”. In a nutshell, ‘genealogy’ is a way of reading history. A way of finding out, explain and understand how several events occurred. To illustrate my point I would like you to think of how many times have you read or heard about the greatest team that ever played the game or the greatest player of all time. Thus, let’s assume that the comparison comes down to the Chicago Bulls that won 6 titles during the 90s (91-93 and 96-98) and the Boston Celtics that won 11 titles back at the late 50s and the 60s. The crucial question here is which are the criteria that these two teams are going to be compared? Someone could easily and falsely answer; statistics. So, in that case we would be comparing the statistics of the two teams, like their winning percentage, their titles, their scoring or rebounding averages and every possible comparable statistical category. This would give as an answer based on the result of the statistical analysis and comparison but would live aside variables that are more important than statistics. We must consider the environment and the circumstances that those two teams won their titles, the antagonism, the rules of the game, the coaching tactics, the team bonding and many more small instances and events that took place during those years on and off the basketball court to fully understand the meaning of the accomplishments of these two teams. To compare them just because their cases look similar and use the numbers that are available through statistical sheets is not the way to compare sports. Whatever happens on the court is the result of various actions that take place on and off the court. The performance of a team or an individual player should not be judged only by what is imprinted on the box score. Sports are a social event and it should be treated like that. It is the same with the best NBA players of each era. How could somebody compare Wilt Chamberlain to David Robinson? I could easily, without thinking too much, propose that if ‘The Admiral’ was playing in Wilt’s era he could be, by far, the best center in the game and thus the best player, if we agree that Wilt was the most dominant player of his era. Putting a player with the height, the body, the athletic and basketball abilities of David Robinson in the 60s it would just be unfair to the rest of the players in the league. Imagine that, in that case David Robinson would be considered by everyone as, probably, the best player ever as Chamberlain is considered by many right now. This means that any comparison between them is unreal and fundamentally wrong. Statistics is the only, seemingly, realistic base of comparison between them which means that, in that case, forget about anything else like the competition that each of them faced, the teammates, the rules of the game and any other small or big event that may occurred in their different eras that might have affected their statistics (an injury for example). Chamberlain averaged 50.4 ppg. in 1962 and Robinson 29.8 in 1994 except form the fact that they were both leading the league in scoring those seasons this numerical representation of their performance tells us nothing more. So, one must know and consider many more things and not statistical measures, but true events before comparing two players from different eras. Think about it. How can you compare George Mikan to Allen Iverson? Who was the greatest? It is like comparing Alexander the Great to Napoleon the Great. Who would win in a battle like this? It is impossible to know. Each of these great strategists, and their armies, were the greatest of its era, but what would be the case in a different historical period under new rules of war, new technologies and different circumstances is not possible to predict. Every comparison would be unreal, it would be metaphysical. From the above it is obvious that there is definitely an essential problem in saying who the best, player that ever played, is. It is impossible to say. You can only compare players of the same era and find out who is the best but there cannot be an ‘intra-era’ comparison. Who is the best, point guard, between Derrick Rose or Bob Cousy? At this point I must say that term ‘greatest’ is not used in the same manner as the term ‘best’ and vice versa. For example, statistics tell me that Glen Robinson was a better player than Robert Horry, but what about the rest of the factors and even if ‘Big Dog’ Robinson was better than Horry, was he greater than him? Thus, we can use the term better to compare players of the same era, where statistics and accomplishments can be examined under the same circumstances and the only way to compare two players from different eras is by introducing a standard measure that will be comparable. This measure is greatness. 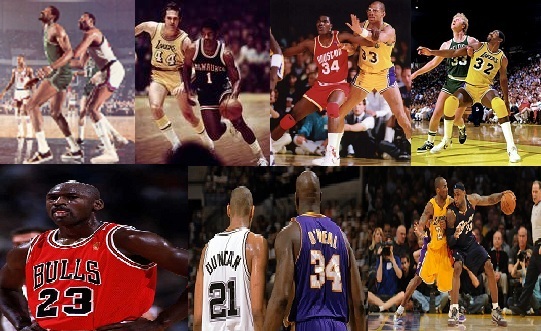 In a future article (part 2) I will try to identify greatness and the criteria by which we can measure greatness.